We live and work in an increasingly interconnected and complex world. In public health, we recognize the influence of various social determinants on health, we talk about incorporating health in all policies and we value inter-professional team approaches to care. No one group has the knowledge or the resources to address the “wicked” problems facing our planet today. 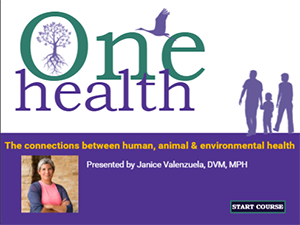 One Health recognizes the connections between the health of humans, animals and the environment; promotes more fully collaborative ways of thinking about problems and their solutions and allows us to take a more integrated systems-based approach to achieving health for all. Connect to resources to help you incorporate One Health in your own work. Note: these resources are organized in the same order that information is presented in the online module. Definitions – What is One Health? Comparative medicine in the twenty-first century: where are we now and where do we go from here? National Link Coalition: What is the Link? Street Medicine: Free Clinics, charitable funds are lifelines for pets of the homeless. 2015. Searching for Shelter: Veterinarians in Wisconsin fight homelessness while protecting the human-animal bond. 2015.